After the selection of RAKtherm as the Piping Solutions of the partner of the The Big 5 Dubai, the largest construction event in the Middle East; RAKtherm is now set again as the Official Piping Solutions Partner of the Global Infrastructure Congress 2018. 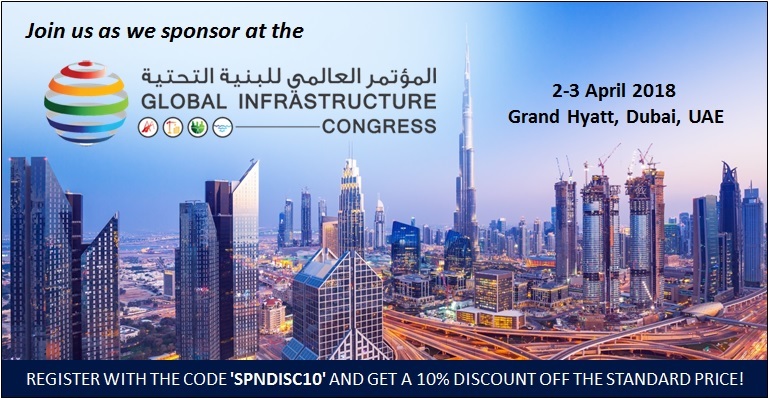 Headed by His Excellency Dr. Abdullah Belhaif Al Nuaimi, Minister of Infrastructure Development, UAE, Chairman of the Federal Transport Authority, and Chairman of the Sheikh Zayed Housing Programme, and other expert technical committee, which will take place on April 1-4, 2018 at the Grand Hyatt, Dubai, UAE. Built to last – driving engineering excellence through innovation for a more sustainable future is this year’s theme of the Global Infrastructure Congress (GIC) 2018. The congress will be a platform to accelerate, change, and build in order to close the global infrastructure gap. Infrastructure plays an important role in a nation’s development, therefore it must be constantly develop, adapt, and grow. For that reason it is the top of the list in the agenda of the global leaders as the developers and engineers encounter challenges to address these demands; and RAKtherm Ultimate Piping Solutions is dedicated to contribute engineered piping systems technology on housing and urban development in challenging sanitary and water systems applications. During the congress, we will present RAKtherm’s breakthrough piping technology to the participants searching for new solutions. RAKtherm’s engineered piping systems will highlight its’ top-notch solutions for challenging projects that require a system beyond the ordinary, wherein the level of quality has been re-engineered to intensify the efficiency to suit variety of strenuous applications. Proven high piping-performance was supplied to 35 countries across GCC, North and South, Africa, South and East and Asia and Europe. Alongside, there will be discussions on the latest innovations, showcase solutions, and engineering practices that will contribute to global progress in infrastructure developments.